When it comes to your website and blog, one of the most crucial aspects of it is the overall loading time. As there are millions of other websites, with hundreds of these offering similar information as your own blow, if the startup time is not quick, an individual is more likely to simply exit out of your website and head to a different page. You don’t want this to happen, so it is necessary to check on your loading time through Pingdom Tools. This website allows you to check the loading time, which in turn can help you determine what is causing the slowdown and what you can do to speed it up. 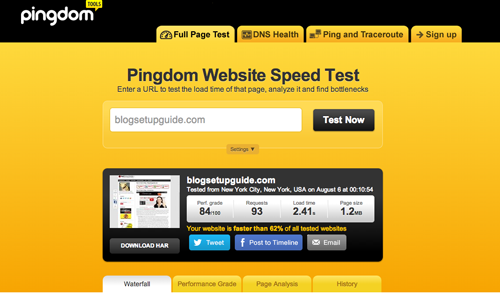 The Pingdom Tools website is pretty easy to use. You need to first navigate over to the Pingdom.com website. From here, simply type in the full URL of the website. The Pingdom website is now going to check your site and see what the time is and if it is a fast loading website or if it takes a long time to display. Once the speed test is complete, the website is going to give you a bit of information. For starters, it is going to show you how long every aspect of the website took to load, ranging from the entire page to specific links, images, videos and graphics. This way, you can see what is slowing down the website and causing it to not load as fast as you might desire. You also receive a grade for the speed out of 100. The higher your grade, the faster your website is and the better off you are going to be with the site. It also shows how long it took to load the website in seconds. All of this information is helpful when it comes to speeding up your website. Now that you know what is slowing down your site, it is necessary to make some adjustments. For one, videos and flash graphics are some of the biggest problems with websites that tend to slow them down. Because of this, you might need to consider removing some of the flash graphics. An individual is going to need to use the latest flash drivers in order to run the information, and if they don’t have these drivers, it is going to slow down the process or cause the computer to not load the website at all. There are different options available to you when it comes to this, so you need to consider what is working best for you and what is lacking. All of these different features and options do allow you to upgrade your website and improve the display speed, all without having to completely start a new website. You might want to think about reducing the amount of information stored on your front page of the blog. Many blogs just allow you to scroll down in order to view information, which is good, but you also need to be able to load the page quickly. This is why you need to create separate pages every few days in order to keep the download time down and to make it easier for individuals to locate specific information. Regardless of the situation, it is essential for you to maintain a fast load time, otherwise you are going to see traffic start to slow down and many individuals are just going to end up going to a different service provider who offers similar information and content as your own blog. The loading time for a blog is essential and helps lead towards success, no matter the content provided.